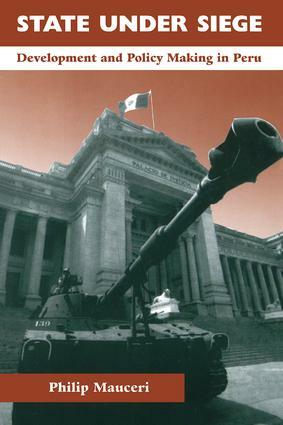 Using a framework that highlights how societal and international factors have shaped state capacities, Philip Mauceri examines the volatile politics in Peru from the Velasco through the Fujimori regimes as the country has moved from a ?developmentalist? state to neoliberalism.Dr. Mauceri begins by reassessing the reformist experiment of the Peruvian military regime (1968?1980), arguing that it led to the development of unexpected challenges to state authority, both from new social actors and international financial organizations. During the 1980s, these challenges intensified, made even worse by poor planning and limited policy choices. The author then argues that the attempt by the Fujimori regime, backed by a neoliberal coalition, to ?retool? the state indicates the degree to which state capacities are determined by social and international conditions. Mauceri also gives special attention to the relation between changing state power and social control. Separate chapters on the evolution of a Lima shantytown and the Shining Path examine how changes in state-society relations have had impacts at the grassroots level.